In its current format Apple Pay is depending on traditional banking and credit card institutions. This has not proven to be a guarantee for a fast world wide roll out of the service. There are tough negotiations involved both on the side of merchants as well as the financial institutions. For example in The Netherlands there have been talks about rolling out for more than a year. Finally next month things should be ready for ‘prime time’. I have no idea what the final ‘service’ will look like in the Netherlands. It surely will be along the lines of scanning your bank debet card(s) and credit cards (hopefully all financial institutions will be involved) in order to enable transactions. The final seal of the transaction will be made through the Touch ID of Face Recognition when iPhone X will make its way to the community. There is the challenge to attract merchants to accept Apple Pay. Judging from the acceptance in the USA where Apple pay already is active, another possible factor that the final service will be somewhat crippled from the start. Suppose that in the near future Apple would be skipping the financial institutions and operate as a financial intermediair supported by a decentralised public ledger (blockchain). It would look something like this. Apple starts the blockchain with its own currency, opening the ‘to be’ blockchain to miners processing transactions and offering financial compensation delivering the computational power for transaction processing. The consumers are able to buy Apple’s own currency, exchanging fiat money for the Apple Currency (which I shall name ACX for convenience reasons). This process is from a consumer perspective similar to buying something from the App Store. Only the exchanged money does not land on Apple’s bank account but on the blockchain, so Apple has a function here as an exchange institution (from fiat money to ACX). As soon as the exchange transaction is processed (all made possible through an Apple device like an iPhone, iPad with a dedicated app) the ACX balance of the consumer is updated and visible from the app. The consumer will now be able to spend his ACX balance online or through Apple Pay at physical stores. The merchant who is affiliated with Apple Pay is then capable of adding balance to his Apple business account also stored on the blockchain. The transaction between consumer and merchant takes place between two Apple devices for example an iPad on the merchant side and an iPhone on the consumer side. There must be a kind of handshake between the two devices, finalized by a ID on both merchant and consumer side. The consumer will be debited for the transaction, the merchant credited. Apple will allow the merchant as well as the consumer to exchange their ACX for fiat money (USD, EUR etc.). Transaction will processed by decentralised processes on the blockchain enabling miners to receive a fee for the transaction. I am sure that solutions along the lines as described above will be made available in the near future. 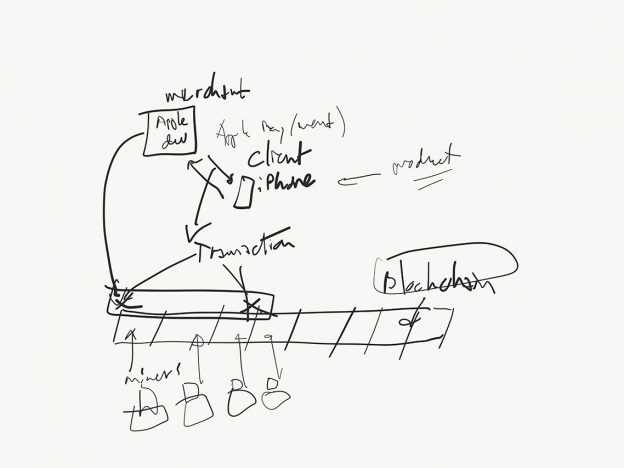 I can imagine that Apple choses its own blockchain, it has the financial power to do so. Not only by Apple but all the major big players (Google, Facebook, Microsoft etc.) wil start offering services along these lines. I use the example of Apple because they are probably already ahead of the bunch and already have an integrated ecosystem. The implications are far stretching: Apple becomes a financial institution itself and largely independent from the traditional banking and credit card institutions. Therefor it may decide to start a specialised branch named Apple Pay. The underlying blockchain technology will be essential to guarantee the integrity and security of the ecosystem. I also understand such a scenario will have far reaching fiscal and financial consequences which I will not address here, but in general Apple’s dedicated branch will behave very much like a traditional financial institution from a fiscal and financial perspective. This entry was posted in Fintech, IT and tagged apple, blockchain, crypto, pay on October 21, 2017 by admin.